In the Oct. 30th episode of Reasonably Catholic: Keeping the Faith, photojournalist Judith Levitt talks about her photographic portraits of women priests, which ran in the Sept. 30th New York Times Sunday Review section. See the full gallery here. One of the many interesting aspects of Levitt’s photographs is that, contrary to what you might expect, the women are not shown performing such priestly actions as consecrating the Eucharist at Mass. Rather, the portraits channel the spirit of Renaissance art, with the women seated, holding a book and wearing robes and stoles in front of a deep blue velvet backdrop. To see the women in such traditional regalia may bring comfort, says Levitt, to those like herself who have fond memories of having grown up Catholic but who find it hard to feel at home in the Church today. 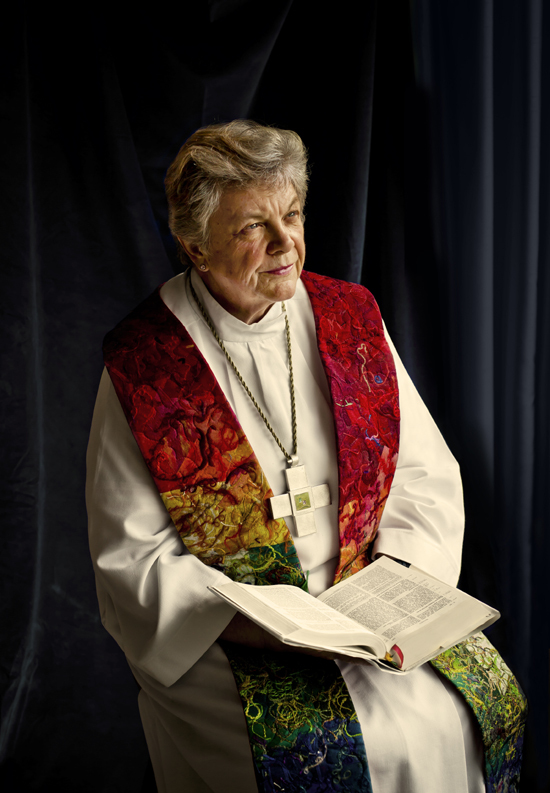 Fresen, photographed in her home in Germany, has since ordained many women priests and is a shepherd of the movement. Categories: Archived shows | Permalink. Another awesome conversation. I’d like to go to one of these women’s masses. Who are the Bishops who ordain them, and aren’t they then defrocked? Just curious about all this. Fascinating. I look forward to the interview with Bishop Dana Reynolds.